For future success, you must ensure that you are running a sustainable business – for people, planet and profit. Sustainability is not simply a check box in the annual report. It is something that affects your business – and creates opportunities. Many AmCham companies are at forefront of their respective industries and have been on the journey for some time, while others are trying to find their way to a sustainable future. AmCham therefore inaugurated the cross-industry Sustainability Forum to facilitate member companies’ integration of sustainable practices into their day-to-day operations. Through collaborative, roundtable sessions, participants share best practices, discuss common challenges, sound out new initiatives – and determine how they can play a role in the Norwegian sustainability agenda going forward. The systematic, long-term management and coordination of environmental, social, and economic principles to ensure responsible, ethical, and lasting business success. Educating clients, partners and public officials. The importance of communicating openly on corporate sustainability challenges. The implementation of new technologies. Assessing how sustainable business practices can contribute to financial performance. Implementing country-wide sustainability initiatives across Norway’s patchwork regulatory framework of over 400 municipalities. Innovation, technology, and regulation – addressing the technology-regulatory gap. AmCham’s Sustainability Forums are hosted on a quarterly, rotating basis by AmCham’s member companies, featuring twenty participants and a program that runs approximately two hours. 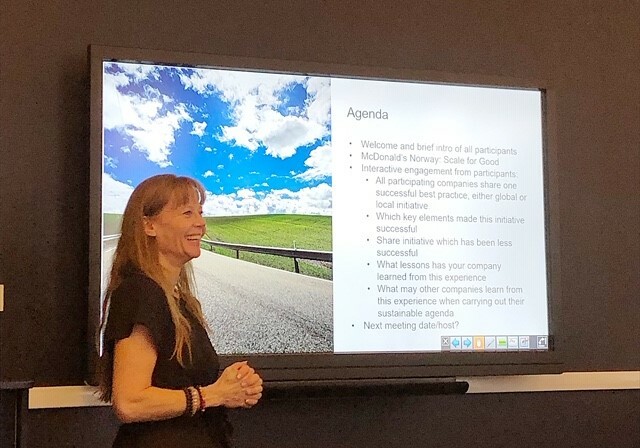 On February 26th, AmCham member representatives convened at McDonald’s downtown Oslo training center for this year’s first AmCham Sustainability Forum. Combining a wide range of industries and backgrounds, forum participants engaged in a rapidly evolving discussion around the challenges and opportunities of sustainable operations in Norway, focusing particularly on regulatory complexities, innovation, and communications strategies. Read more HERE. Highlighting the importance of collaboration with the private sector, State Secretary Frølich Holte shared insights into the Norwegian Government’s efforts toward reaching the UN’s Sustainable Development Goals (SDGs) with senior representatives from AmCham members Coca-Cola, DNV GL, InterimLeder, Fast Solutions, Gelato, McDonald’s, Umoe Restaurants, Radisson and Roche. Read more HERE. 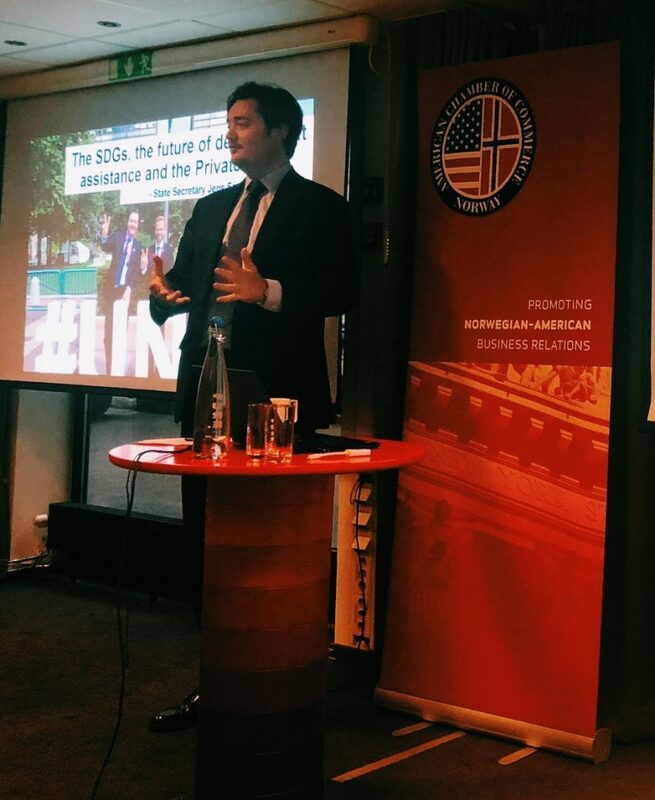 Joined by senior representatives of Coca-Cola, Fast Solutions, Gelato, McDonald’s, Philip Morris, Radisson Hotel Group and Roche, Gambit Hill+Knowlton presented key findings from their 2018 Business Sustainability Study of 26 of Norway’s largest companies as AmCham hosted the first meeting of our new cross-sectoral Sustainability Forum. 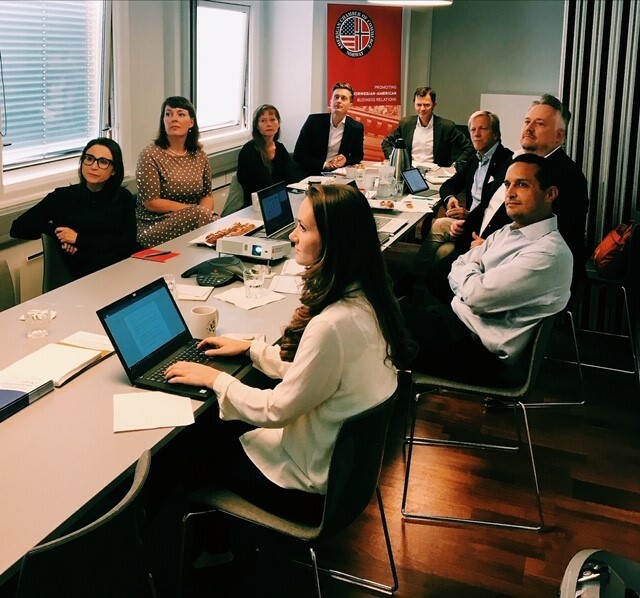 The focus of the initial meeting was for invited participants to openly discuss opportunities and challenges, share best practices and determine how AmCham companies can best play a role in the Norwegian sustainability agenda going forward. Read more HERE. Sustainability is all about culture, which needs to be successfully embedded into the company. The term is not merely about environmental issues, but rather it encompasses a broader perspective of doing business, as represented by the UN’s 17 Sustainable Development Goals.